Museum open Thursdays, and the second Sunday of the month, from 2:00 P.M. to 4:00 P.M. Welcome to the Original VHS web site! 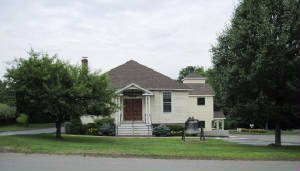 The Vernon Historical Society began in 1967. Since its beginning it has collected and preserved many items of local historic interest. The collection contains paintings and etchings of Charles Ethan Porter and Gustave Hoffman. On permanent display in the auditorium are the works of Dr, William Schneider, local physician and painter who passed away in 1984. The Society has computerized its collection of books and has set up a library for public use. The museum database can now be searched by the staff to provide visitors with listings of items in collection. We invite you to visit the Vernon Historical Society Museum. Admission is FREE (Donations accepted). Open every Thursday and the second Sunday of the month. All text and images published on this Website are for personal and/or educational use only. Reproduction, redistribution, or exploitation of this site's contents for personal or commercial gain is strictly prohibited. © 2001-2010 Vernon Historical Society. All rights reserved.